A few months ago I noticed a sign on the side of a car about a local massage business and thought, ooh, I really must check that out. 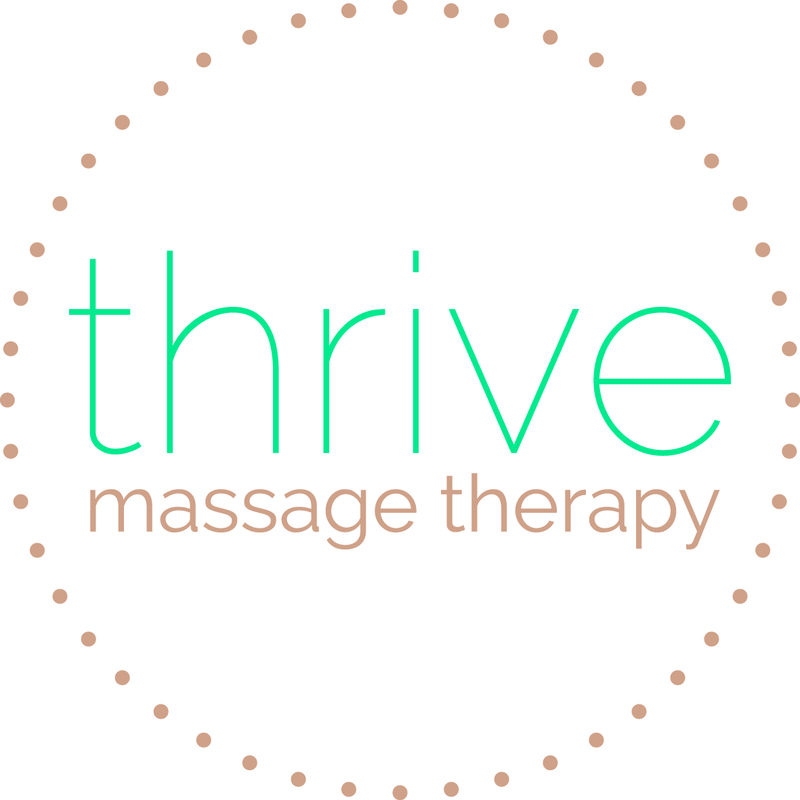 About two weeks later Nicola messaged me asking if I would like to review her massage business – Thrive Massage Therapy. Turns out it was her!! I thought for less than a second before accepting her lovely offer! Initially Nicola had a Guest post on NorthHanstMum because I wasn’t available for the first month after she contacted me. These days I’m really busy in the evening as well as the day times and Nicola was very accommodating of my schedule. Nicola takes bookings via her website, phone, text or email. We arranged a date and she sent me instructions of how to get to hers. I found Nicola’s house really easily, she has a Thrive Massage picture in the window and her house number sign is lit up, so it’s obvious which is her house. My first impressions were, WOW! How TIDY is her downstairs! lol. Nicola welcomed me and led me into her massage room. I was (and still am!) sooo impressed!!! Her massage room is AMAZING! It’s a purpose built room, built just for Nicola’s massage business. It’s the space that would be a garage so it’s quite large and she has lots of lovely storage and a large massage couch with lots of space around it. 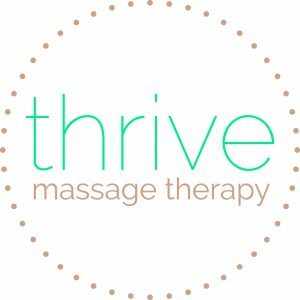 I’ve had massages at many other places over the years and the rooms are always TINY, many with not enough space for the masseuse to comfortably walk around. 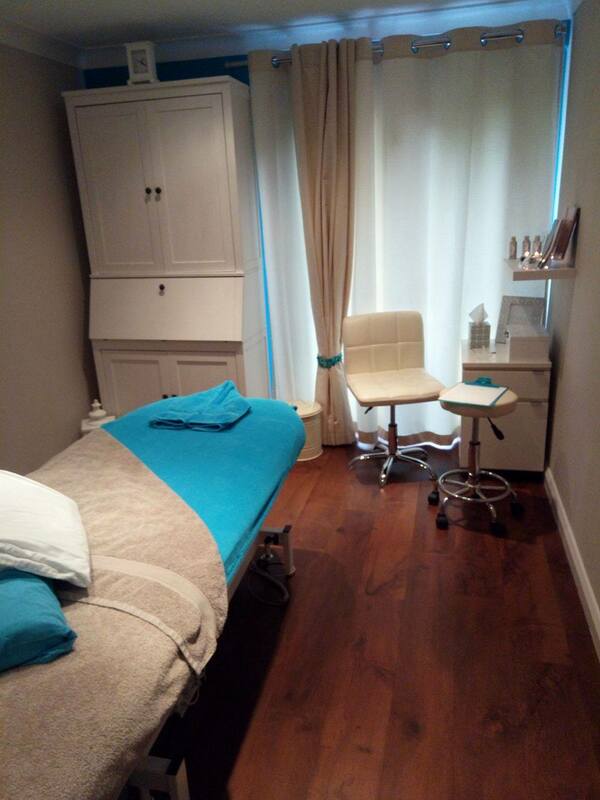 Nicola’s massage room has lots of space and such a lovely ambience. She even has the plug sockets built in so that they are under her massage table, so she doesn’t have to walk over cables! One of the things I was most impressed with is all of the marketing that Nicola has, it’s so professional. It’s obvious that a LOT of thought has gone into Nicola’s business and how she markets her services. Even the towels she uses match her theme colour!!!! These little details are so important and really helped me to feel like I was dealing with someone who really cares about her business. I also really liked that all of her qualification certificates are up on one wall, behind the door, which gave me a nice warm feeling that she knows what she’s doing!!! The massage room is very welcoming and exactly what you would want in a massage room. We had a chat before the massage started, so Nicola could check whether I had any health issues that she needed to be aware of. The room was soo relaxing, I nearly fell asleep then! Dimmed lights, candles, lovely smells and music that’s actually soothing during a massage. The room was the perfect heat too. I had a massage a few years ago, at a local spa, where the massuese was pregnant so she had a dehumidifier in the room which kept the heat down to 17 degrees ( I knew this because I could see the red screen telling me it was 17 degrees all through my massage). As she was heavily pregnant I didn’t feel I could ask her to turn the heat up but I was FREEZING which ruined the whole experience. Nicola’s room temperature is just perfect. Nicola’s massage couch can be heated, which was wonderful. The towels were lovely and soft and I could have happily gone to sleep there with or without a massage! lol. Ok, so I know I’m always positive on reviews but the massage with Nicola was AMAZING!!! Definitely one of the best massages I’ve ever had. I was convinced that she used hot stones, but it’s just her hands and arms that she uses. It never felt like she was going through the motions either. I’ve had massages before where the masseuse clearly doesn’t want to be there and it feels like they are doing the “dot to dot” massage on your back. Nicola’s style wasn’t like this at all. It was very fluid and didn’t feel stilted. Before the hour long massage started Nicola had asked me if there were any specific areas that I wanted her to focus on. I’ve had persistent shoulder pain for the past 6 months and despite having physio and acupuncture it’s still not properly fixed. I was a little apprehensive that she would “go to town” on my shoulder, like I’ve had other masseuse’s do and has meant that I’ve been in agony for weeks after. Nicola used EXACTLY the right pressure. Sometimes when you come out of a massage you feel a bit bruised and battered but I felt exactly as I wanted to feel when the massage was finished. She even found bits of me that I didn’t know were tense!! I came out of my massage feeling really relaxed and “flexible”. One of my favourite bits was at the end of the massage. Nicola has an tea caddy filled with lots and lots of herbal teas and she lets you take one home with you. Such a lovely and thoughtful idea. Nicola also reminded me to drink lots of water and take it easy for the rest of the evening. 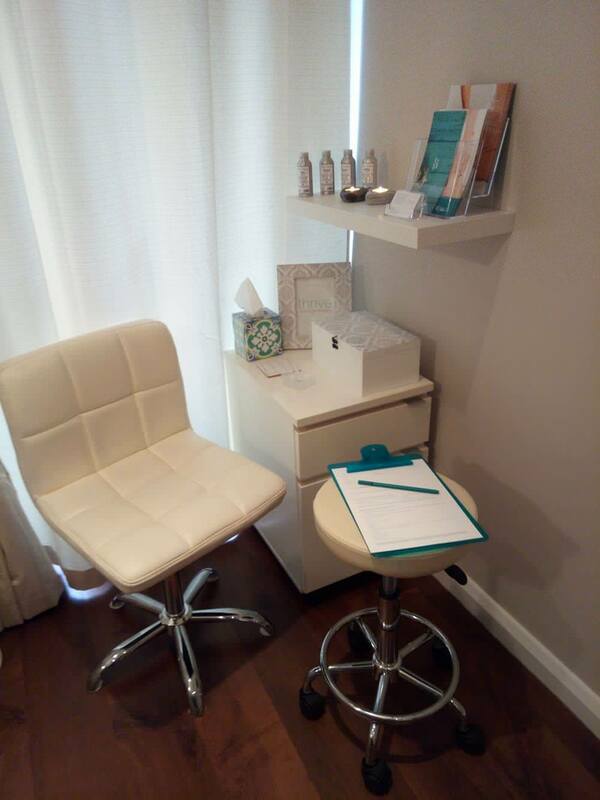 She also gave me an aftercare leaflet with advice about what to do after a massage to make the most of it and a stamped addressed envelope which had a feedback form in, which if I completed and sent back to Nicola, meant that I would be entered in to her draw to win a free massage!!! Definitely 5 out of 5!! I felt really pampered and it’s definitely one of the best massages I’ve ever had. My skin felt amazing afterwards and my shoulder has felt much better since my massage with Nicola. I used to get my massages done at my local spa/gym but having had two massages with Nicola (I went back as a paying customer and my massage was just as good! ), I won’t be going back to the spa at the gym. The quality of service that you get from Nicola is far above what you get from an impersonal service like a massage at a gym. 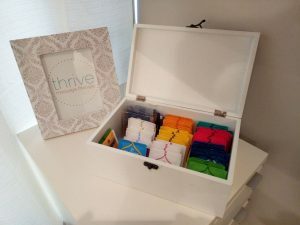 Disclaimer: This post is a review of Thrive Message therapy. My massage was supplied free of charge for the purposes of the review. I was not expected to write a positive review and any opinions expressed are my own.